Boats rescue traffic on the flooded Jimmy Johnson Road in Port Arthur, Texas, on Aug. 30, 2017. Photo: Marcus Yam/ Los Angeles Times via Getty Images. 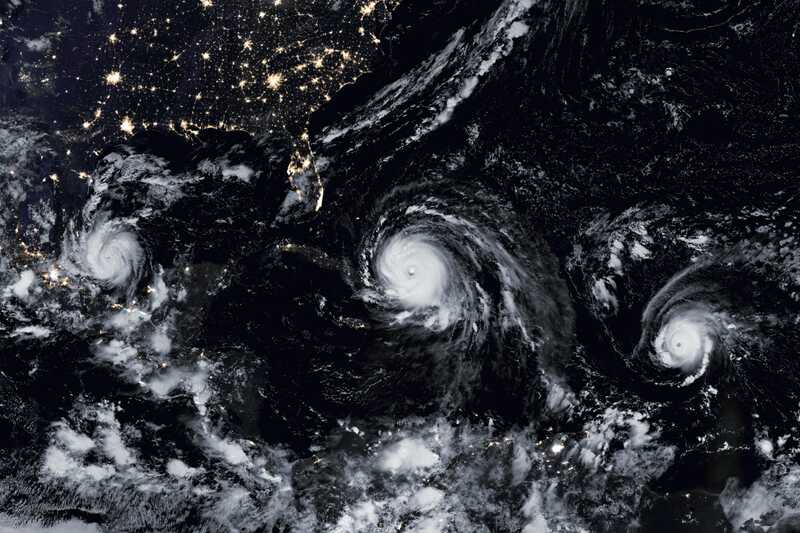 Over the past 70 years, the speed of hurricanes and tropical storms has slowed about 10% on average, according to new research. That doesn’t mean storm systems have become less intense, just that they’re crossing Earth more slowly, which actually gives storms more time to dump rain and lash an area with powerful winds. Over land, especially in the North Atlantic and Western North Pacific, storms are moving 20-30% more slowly. When Hurricane Harvey hit the Texas coast on August 25, 2017, it made landfall as a Category 4 storm with 130-mph winds. Harvey was the first major hurricane to hit the US since 2005, but it weakened to a tropical storm over land, which hurricanes tend to do when they are no longer drawing warmth and energy from the sea. But then the storm did something different. For days, Harvey dumped unprecedented amounts of rain on and around Houston. It sucked up more water from the Gulf and even reversed direction, setting records and causing more than $US126 billion in damage and economic loss. Instead of being anomalies, storms like Harvey might represent a sort of new normal, according to a new assessment published in the journal Nature. The analysis, done by by NOAA researcher James Kossin, shows that hurricanes, typhoons, and tropical storms are moving more slowly over the Earth’s surface, especially over land. That doesn’t mean these storms are any less powerful – in fact, they may be intensifying and developing into powerful hurricanes in a shorter time span, according to other recent research. Instead, moving at a slower pace gives storms even more time to dump rain and whip coasts with powerful winds, making them more destructive. Storms have slowed by an average of 10%, according to Kossin’s research. Over the time period he studied – from 1949 to 2016 – the average global temperature rose 0.5 degrees Celsius due to climate change. A warmer atmosphere can hold more moisture, so when you take into account 1 degree Celsius of warming, a 10% slowdown could double the amount of rainfall and flooding that an area experiences. “These trends are almost certainly increasing local rainfall totals and freshwater flooding, which is associated with very high mortality risk,” Kossin said in a news release. Kossin found that the amount storms slowed down varied by region across the globe. NOAA/NCEIThe percentages show how much tropical cyclones have slowed in those regions in the past 70 years. Local tropical cyclone rainfall totals would be expected to increase by the same percentage due to the slowing alone. Increases in rainfall due to warming global temperatures would compound these local rainfall totals even further. In general, cyclones in the western North Pacific – where these storms are known as typhoons – slowed the most, by 20%. But Kossin also looked at changes in the speeds at which storms moved over land: in the western North Pacific, storms slowed 30% over land, while in the North Atlantic, they slowed by 20%. 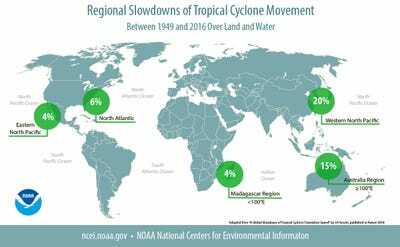 Kossin thinks this cyclone slowdown is likely caused by changes in the circulation of Earth’s atmosphere due to climate change. While the factors that drive atmospheric winds are complicated, one expected symptom of climate change – and something that’s been observed over the time period Kossin studied – is that the atmospheric factors that drive cyclone movement are weakening. “Tropical cyclones tend to ‘go with the flow,’ meaning that the direction and speed at which they travel are guided by the winds in the surrounding environment,” Christina Patricola, a climate researcher at Lawrence Berkeley National Laboratory, wrote in an article published alongside Kossin’s new paper. That means that in a warmer world, we should expect storms to become more intense, dump more rain, and move more slowly, causing more damage. NASA Earth Observatory images by Joshua Stevens and Jesse AllenHurricanes Katia, Irma, and Jose churn their way through the Atlantic and Caribbean. The peak rain rates of storms have increased by 30% over the past 60 years. As we saw with Harvey, storms that move slowly can cause an incredible amount of damage. We saw the same destructive slow rainy patterns with Typhoon Morakot, which hit Taiwan in 2009, and Cyclone Hyacinthe, which looped by the island of Réunion in the Indian Ocean several times in 1980, according to Patricola. One interesting wrinkle raised by Kossin’s new research is that we don’t know if storms like Harvey have been dumping more rain primarily because they’re moving slowly or because they’re holding more moisture due to atmospheric temperatures. It could be both. We need more research to know just how much more we should expect cyclones to slow in a warmer world, according to the new paper. But as hurricane season kicks off in the North Atlantic, slower storms are yet another thing to look out for.